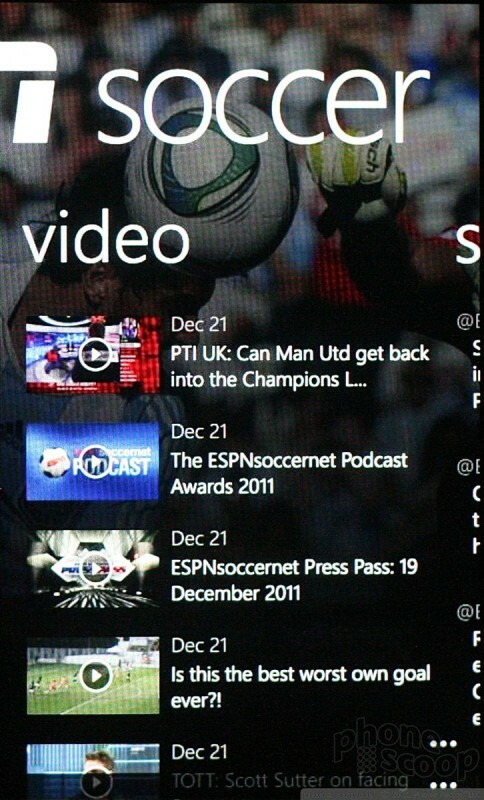 There's a Nokia-made application called App Highlights on the 710. This app is tied to the Windows Marketplace for Mobile and offers a rotating array of Nokia-recommended applications for download. It's OK. The Lumia 710 supports the usual set of Bluetooth profiles. I had no trouble at all pairing with headphones or my car. Calls sounded really good through both mono headsets and my car's hands-free system. The stereo Bluetooth profile also worked well, and I was able to push pictures to my PC with no problem. The 710's lockscreen clock is the same as other Mango phones. It is a bit too small, if you ask me, and isn't as noticeable as the date is (which I usually don't care that much about). I wish there were a way to control the clock on the lock screen. There isn't. It suffices, but just. 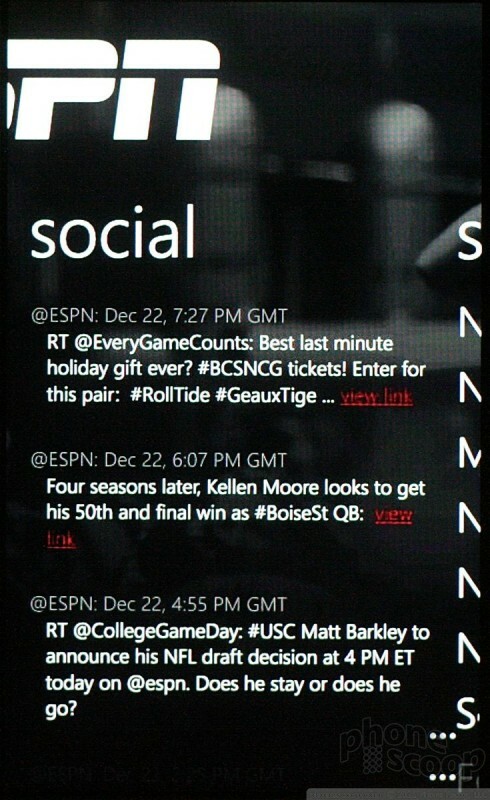 One of the essential services Nokia is bringing to Windows Phone 7 is the ESPN Hub. 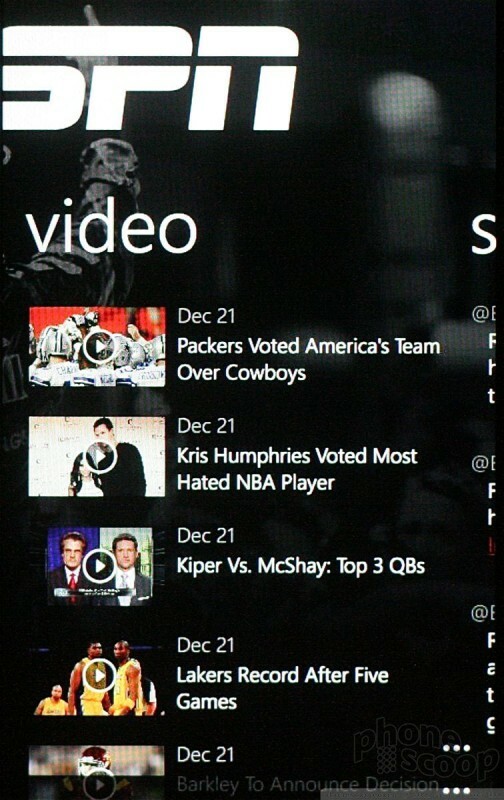 The ESPN Hub is made specifically for sports nuts and provides access to top sports news, scores, and video highlights. There's one major problem. The app is not U.S.-centric. That means sports such as soccer and cricket are given more prominence that NHL hockey or NFL football. There is a section at the bottom of the app reserved for U.S. sports, but it is merely a link to the mobile version of the ESPN web site. That's pretty weak, Nokia. I understand that catering to every market around the world isn't going to happen, but major markets should see this app tweaked a little bit. Another essential service being offered to Lumia 710 owners is the Nokia Drive application. Nokia Drive is a new piece of navigation software developed for Mango. This app is LEAGUES better than the old Bing Maps. Maps are offered in 2D or 3D. It's also more enjoyable than Google Maps, though Google is just as good at getting you from Point A to Point B. The 3D maps view lets you adjust the angle of view and is a really neat way to view the surrounding landscape and get a perspective on how the map relates to the real world. For point-to-point navigation, you can choose from a range of different voice styles (female voice w/UK accent is the default). 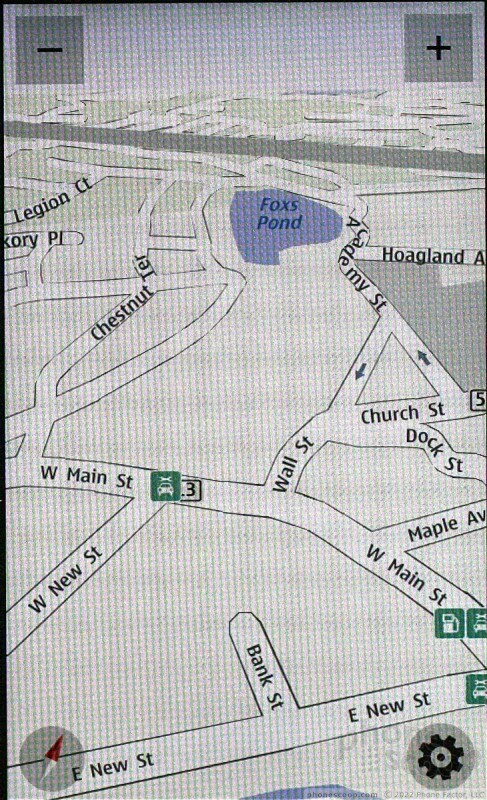 Maps can be set to day or night mode, landmarks such as gas stations are visible, and Nokia Drive offers full 3D landscapes (i.e., buildings and such) in select cities.